These guys apparently like bed more than me…and trust me, that’s saying something. That being said, there’s nothing sleepy about this indie rock/post-punk debut. The British quintet’s love for bed is multifaceted, (sleeping, passing out, doing it) as Pitchfork notes in a review actually written by (GASP!) a female. 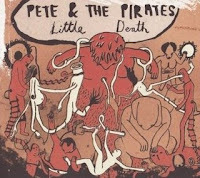 However, the album name says it all: “Little Death” is the literal translation of the French term for…well, look it up. The album makes me want to put on headphones and bomb around town. It’s hooky, rollicking, and at the risk of ruining the record for many a music snob, refreshingly accessible. You’ll find no grandiosely poetic lyrical feats here, and your quest for the ever-elusive, highly-prized and ill-defined “originality” certainly won’t end with this album. But if you like the Futureheads, and are maybe just a little bit of a rock romantic, you’ll like the record. Besides, who doesn’t love a good pirate? Rrrrrrrrrrrrrrrrr! I love me some pirates. And some snarky rippage on Pitchfork does a body good. xoxo You so funny.